In a time of global and domestic conflict we need CONNECTION, not divisiveness. We need a direction that allows humanity to THRIVE, not simply survive. Thriving together in community has meant enhancing our capacities for empathy, communication, and love. It has meant collaborating to solve problems. It has meant developing justice, fairness, and balance. More than 100,000 people are still living community settings: in ecovillages, cohousing, communes, and communities of all kinds around the world. They’re working together to create fair, sustainable, and satisfying models of society. Are you ready? within the community fit for you. For over 20 years we have been bringing you the Directory, now in it’s 7th edition. 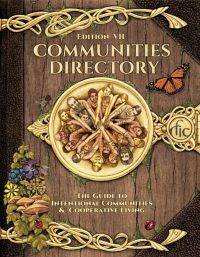 In this edition you’ll find over 1,200 communities, full-page maps showing where communities are located, charts that compare communities by more than 30 different qualities, and an easy index to find communities interested in specific pursuits. 7th Edition. Now $30! Was $35. Get even more discounts when combined with a subscription to Communities magazine. 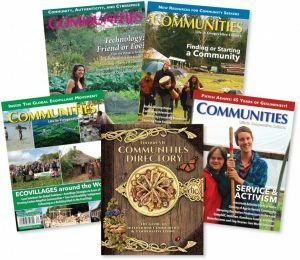 Receive your 600+ paged Communities Directory and a 1-year subscription to the leading magazine publication about intentional communities, all at a $15 discount! Let’s move in the right direction, with Communities!